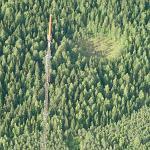 TV and radio transmitter on Tiirismaa hill is the tallest structure in Finland. It was built in 1967 and its height is 327 metres. Tiirismaa itself is the highest point of Southern Finland (222,6 metres from sealevel).